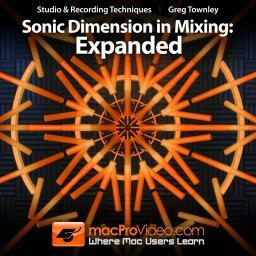 The first video, Sonic Dimension, I explore the concept of three dimensional mixing. In Expanded, I explore further and examine with greater detail, methods for achieving sonic dimension with a variety of elements. I chose the track in this video for its sonic complexity, musical dynamics, and the inherent challenge it brings. “””Sonic dimension, emotional impact, clarity. Three things that both fascinate and scare me but after watching Sonic Dimension and Sonic Dimension Expanded I have a much better understanding of these terms. Greg Townley cleverly walks you through his tricks for achieving dimension on a rather challenging track. A must-have for every sound engineer. “””I watched Greg’s 1st tutorial at least a dozen times. I will be watching this one a dozen as well. Greg Townley is absolutely brilliant. Highly recommend for all levels especially professionals. “”””I have never learned more, or have been inspired more in under one hour in all my years of music. As someone else wrote, this truly was an “epiphany.” This was the best video series I have ever seen! “”””In my 20 years as music producer I have never seen so much know how, transferred in such a compact way to learn. Great stuff! “”””This tutorial is life changing. Thanks Greg.